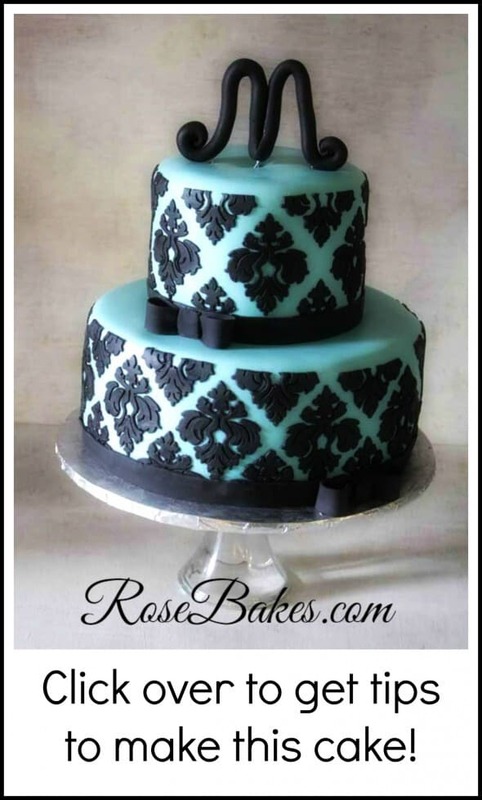 Today I’m going to tell you about this Tiffany Blue & Black Damask Baby Shower Cake. This is one of those cake designs I fell in love with immediately. I love the Tiffany blue & black contrast. I love the ribbons and small, simple bows. I love the damask. Everything put together just works. And it reminded me of a bridal shower cake I did way, way back before I was even doing cakes publicly much – this Pink & Black Bridal Shower Cake. Maybe it’s the black that make them similar to me – or maybe the initial on top. Either way – I’m a big fan of the contrast of black with lighter colors… it just works! 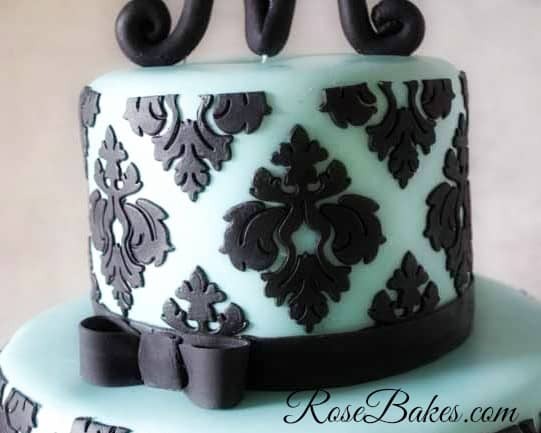 Anywho…I didn’t get the damask pattern perfect on this cake, but it was my first time to use Marvelous Molds and I was very happy with it! There was a learning curve to getting the molds to work just right, but after we got the hang of them, it was great! I highly recommend watching the videos provided on the website if you decide to try out the silicone onlays! For all of the black on this cake, I used Satin Ice Black Vanilla fondant. I mixed it a little Tylose to form the “M” on top and the bows. I also used my ribbon cutter for the ribbon borders and bows. 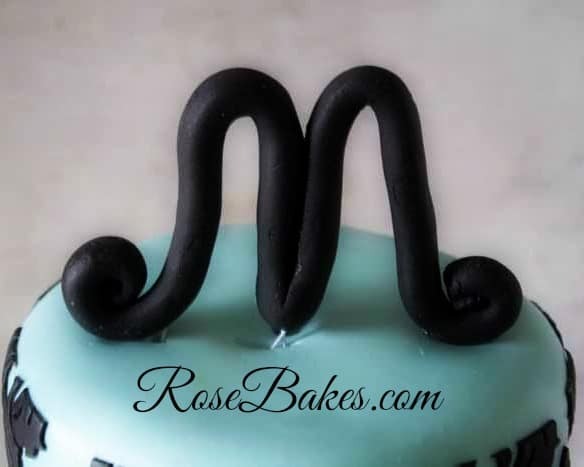 You can see how I do ribbon borders here and get some tips for making the topper from my How to Make Fondant Number Toppers. Oh, and I used 22 gauge wire inside the “M” and I inserted the wires into coffee straws in the cake to keep it “food safe”. A few last details… The cake was size 6″ and 10″ round. It was Butter Pecan flavored cake with Butter Pecan Buttercream Filling. 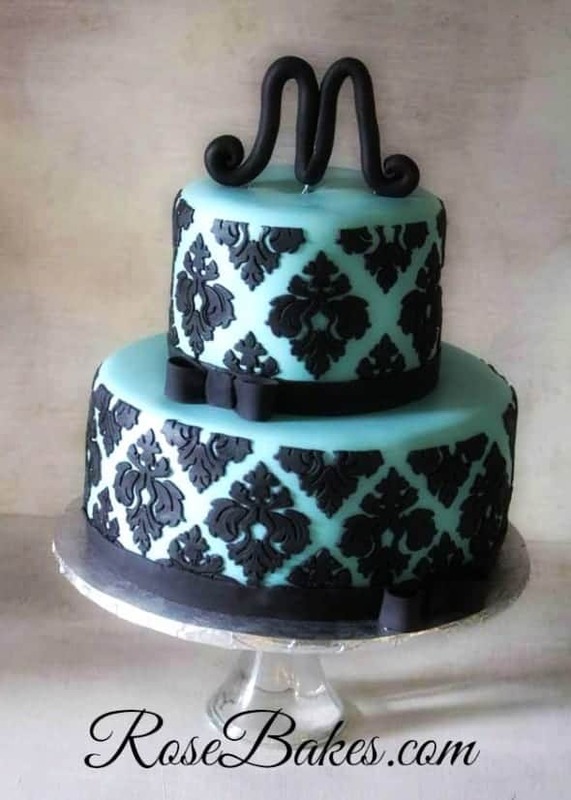 I used homemade marshmallow fondant for the blue – I think I used a mix of Electric Blue and Teal Americolor Gel Colors to get the Tiffany Blue color. The original design was found here on Flickr by Chantilly Cake Designs. And that’s all I’ve got for you. Do you have any questions about this cake? I’d love for you to leave me a comment! And if you don’t mind, Pin this image below for me… thank you! 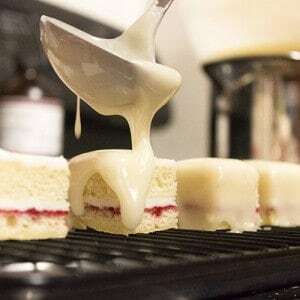 Hi Rose, I love to see all the different cakes and thanks for all the tips. I sure go to make this a daily visit.